Staying hydrated is essential for good health. A large percentage of our body is made up of water, so keeping that supply full is important. It seems obvious enough that to stay hydrated, you should drink, but you could be hydrating yourself incorrectly. When we exercise, we sweat and lose water. To combat this, we drink during the workout. But if you’re not hydrating yourself before the workout, you’re hydrating wrong. Not drinking before a workout can lead to headaches. You put yourself at risk for dehydration as you will lose more water than you have in your system. At least 30 minutes prior to exercise, ensure you drink up. You probably know that when you drink coffee or tea, you tend to visit the bathroom much more often. These beverages are known as diuretics, and for this reason, people may avoid them as they think they make you lose water. Through urinating, you do lose fluid, but coffee and tea still contain water to hydrate, so you don’t need to skip them. When we’re thirsty, we drink, or when we’re exercising, we drink, but you don’t have to just answer your body’s call to stay hydrated. Even if you’re on the couch or at your desk, it’s still important to stay hydrated. Staying hydrated keeps us alert, so if you’re at work, it’s a good practice to drink water as it can keep you awake, energized, and going throughout the day. Time and time again, it is instilled in us to drink eight glasses a day. New research from the Institute of Medicine actually recommends 11.4 cups a day – but even this guideline differs between individuals. Instead of trying to follow a generic rule, go with your body. 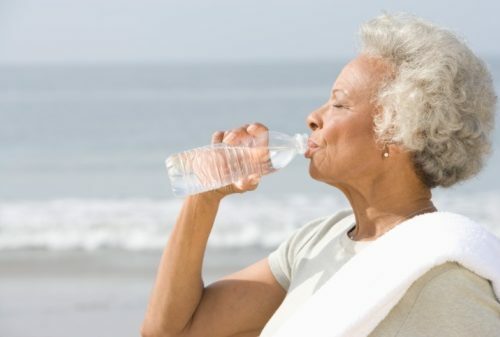 Individuals of different age, activity level, and size require different amounts of hydration. While eight glasses a day is a good start, feel free to amp that up to fit your own personal needs. Putting back too much water too quickly isn’t a wise choice, as the stomach is only able to handle two to four ounces every half hour. Furthermore, the kidneys can only filter through 27 to 33 ounces of water per hour. Overdoing this can lead to stomach pains and cellular swelling. Drink adequate amounts of water at a steady pace instead. Drinking super cold water can stimulate the vagus nerve to go into shock, which can actually lead to passing out. Furthermore, super cold water constricts blood vessels, which can make it difficult to become hydrated. Sugary beverages can lead to spikes in blood sugar levels. Additionally, your body needs to rid the body of the excess sugar, so you begin to urinate more often to rid yourself the sugar. High levels of sugar in the urine is also an early sign of diabetes. Dark urine is a sign of dehydration, but clear urine isn’t always good either. You want to aim for a pale-yellow color because clear urine may be a sign of overhydration, which can turn out to be a bad thing. Additionally, it’s okay to “cheat” and sneak in hydrating foods like fruits and vegetables, which can keep you hydrated without having to drink water. Water is essential for human life and bodily functions. Ensure you are hydrating properly to get the most benefits.